The Steve Howe solo at this show was "Provence / Clap". On June 12, 2009, I graduated from Montomery Middle School in San Diego. As a graduation present, my Dad, Dan Shinder gave me a ticket to see Yes and Asia in concert. Fifteen days later, I went to the Las Vegas show with him, his girlfriend Joanne, and my uncle Lee Accardy. We arrived around 6:30 PM. Imagine how amazed I was when I walked in and saw how big the place was. The show was to start at 7:00, but it began 15 minutes later. We sat on the risers near Steve Howe. When the show began, Uncle Lee said, "Can you believe it? He's right there!" The screens showed the Asia logo. Music videos was shown on the screens as "Wildest Dreams" and "Only Time Will Tell" were played. The next song was the only PHOENIX song in the set, "An Extraordinary Life". The screens showed pictures of the band members when they were younger. The next two songs were "Video Killed The Radio Star" and "In The Court of the Crimson King", tributes to The Buggles and King Crimson respectively. After these songs, the ALPHA songs, "The Smile Has Left Your Eyes" and "Don't Cry" were played. During "Fanfare For The Common Man", Carl Palmer did his drum solo. My Dad yelled out "Take off your shirt! ", a reference to his ELP days. Asia also played the song my Dad was hoping they'd play, "Sole Survivor". Before the last song, someone shouted "Is this the heat of the moment?" And surely enough, it was. John Wetton and Geoff Downes were back to back near the end. The whole audience was asked to sing "Heat of the Moment", and we did. Asia finished around 8:15. Though they didn't play "When The Heart Rules The Mind", I was pleased. 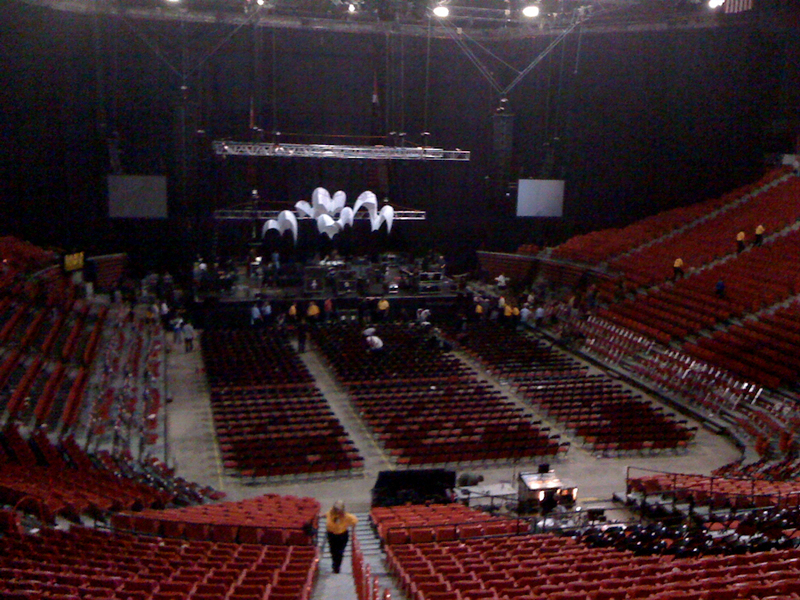 Half an hour later, "Firebird Suite" was heard throughout the venue. The curtains moved to reveal Roger Dean's stage art. That's when Yes (formerly known as Steve Howe, Chris Squire, and Alan White of Yes Featuring Benoit David and Oliver Wakeman) appeared on the stage. "Siberian Khatru" opened the set just as I predicted. I clapped along often during "I've Seen All Good People" and even sang the "diddit" parts. I got my cell phone out in time to record "Tempus Fugit". Oliver Wakeman's vocoder voice was definately different from Geoff Downes'. During "Astral Traveller", Benoit was jumping around and Alan White played his drum solo. When the song was over, I realized that I didn't press record on my cell phone! Near the end of "And You And I", Steve Howe dropped his glasses. He looked down and seemed motionless. His roady ran to get the glasses as Steve bent down. As the glasses were being repaired, Chris Squire said," You'd think that we'd give Steve a break right now". They didn't and Steve played his solo. I'm not sure what the first song he played was called, but the next one was "Clap", which I clapped to. Steve put on his repaired glasses and said,"This is from 90125". At first, I thought that they were gonna play "Changes", but it was the traditional "Owner of a Lonely Heart". Unlike in concert films I've seen, Steve played the guitar solo. I recorded "Machine Messiah" with my phone. Steve would move in a funny way and make a face. The smoke machine was used during the quiet parts. Benoit also bent down with his acoustic guitar and slowly turned. It is amazing how great they still are. Howe is enhancing his legend with this effort. I first saw YES live in Louisville in 1972 and I have never been disappointed with a live concert, but with age I appreciate the effort this must take. Oliver Wakeman is less animated than his dad, but plays well and seemed into it for the Trooper encore. (And he is really nice if you get to meet and greet.) Benoit David sounds just like Jon, and surely knows no one could replace Jon whom we miss. Alan was solid and Chris just keeps going-what a lovable anchor. The set list reflects their huge collection of great songs--they can play whatever they wish in my book! I loved Asia before, but seeing them live was a real treat. Carl Palmer's solo in "Fanfare" is worth the trip alone. This double bill is a great idea as long as Steve can keep it up; even better than the Eagles opening for YES in '72! My son and I travelled from Indiana for this Vegas stop, and it was worth every mile. Catch this show if you possibly can! I was excited to see Yes, but initially a little disappointed that Jon wouldn't be here. Everybody was telling me that the 2 new members were great but I hadn't seen much footage from this tour yet, so I went in not knowing what to expect. I figured in the worst case scenario, going to the show would be worth seeing Steve, Chris, and Alan on their own. In the end, this show was amazing beyond anything I had expected. I was mostly there for Yes, but Asia put on a great show and I really enjoyed the surprise cover songs. I had listened to "In the Court of the Crimson King" earlier that day not having any clue I would also hear it at the concert! Then Yes took the stage. Small accidents aside (like Steve's glasses) the performance was close to flawless. I was a few rows back on Steve's side of the stage and was blown away by his talent and energy. Between the 2 bands, he performed for over 3 hours but never once cut any corners. In a time when live music seems to be a wasteland of poor quality and lipsynched or fake performances, these guys stand out above everybody else. The setlist was unusual and it was great to hear some less popular material. Some of the best performances of the night were "Astral Traveller", "And You And I", "Machine Messiah", and "Starship Trooper". My only real complaint is that the audience was way too sedate. There were a few people clapping and dancing in the aisles, but definitely not enough participation. And I still hope Jon returns in the future; it would be great to see Yes with 6 members! If you're reading this and trying to decide whether to see a future show on this tour, I would say to go for it. This concert was worth every penny and there are no regrets! This show was the third time we bought tickets for this tour - the first two tour attempts were cancelled - and it was well worth the wait. 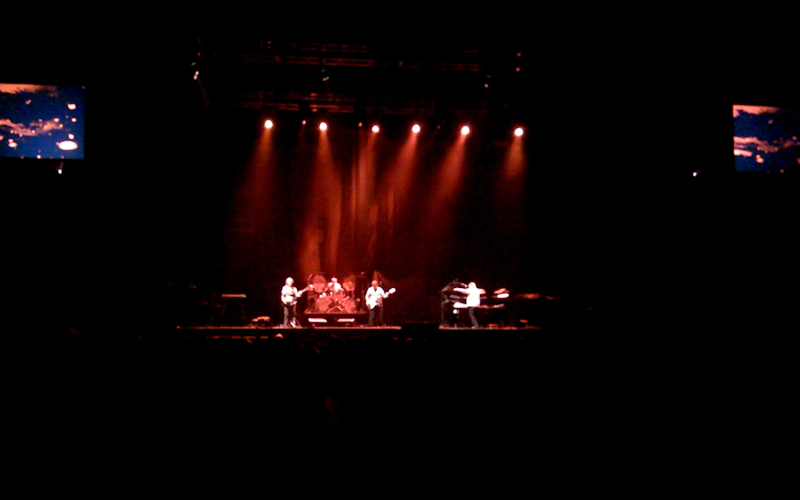 Steve Howe IS the hardest working musician around and both groups did a great job, even with the stage gremlins present. This may not the first time one person has performed in two bands in the same show, but what a feat to pull off and he was stellar. The biggest treat from ASIA for us was their rendition of "Fanfare for the Common Man". Carl Palmer showed why he is one of the best drummers in the world (although Alan White's solo in Yes' set was also very good). Yes' set was excellent starting off with "Siberian Khatru" just as in Yessongs and culminating with "Heart of the Sunrise" and "Starship Trooper". This was the first time I have heard "Machine Messihah" in concert and it was fantastic. Chris and Alan were ever energenic and Oliver Wakeman's as good as when I saw him and his dad in concert back in the 90's. One point though, Mr. David was very good and he does have a strong range, but noone can replace Jon. My teenaged sons loved every minute of the whole night and are part of a new generation that appreciates progressive rock. On this night we got the Yes/Asia package. Despite the few technical glitches during the peformances, it was a great night for the bands. Asia put in a nice 1hr. compact set which included heritage classics from King Crimson,ELP, and the Buggles. It was my 3rd time seeing Asia with the other shows I have seen in 2006 and 2008. Now for Yes, contrary to other opinions, I thought the Yes set was a nice mix. As much as we wish Jon Anderson could be onstage, Benoit David really rose to the challenge of fronting the band. He surpassed my expectations. Yesfans all over should give this guy a listen! He has a future in the music business. As for Oliver Wakeman, he did a nice job handling the keys while not showing the flash or flair of his father Rick or even his brother Adam. I hope he will grow into the position. Chris Squire played great on bass and sounded good vocally. Alan White was steady on the drums although following the quick kinetic style of Carl Palmer, he looked a tad slower. Steve Howe was the busiest man on the night. With the energy he showed with both Yes/Asia, he looked like he could play another hour or two. This was my 11th Yesshow and the 4th in this venue. (The others being 1984 90125, 1991 Union, and 1994 Talk.) It was a winning night for the fans in attendance. It was goose bump time when Firebird Suite paved the way for the band's entrance. I was more than a bit worried about this line up without Jon Anderson whose spirit I consider the essence of Yes. I have seen Journey with Arnel Pineda; the new lead singer for who many considered the irreplaceable Steve Perry. It is true Pineda can hit the musical marks, but he also breathes the soul of the music. What about the new kids, you ask? The good news for Yes fans is that Benoit David has IT. I read about some uneven performances early on but it is difficult to discern listening to clips on Youtube because the audio is suspect. Benoit does seem to have gotten better as his confidence has grown with more experience. He certainly has a daunting task at hand as to step in and replace Jon is a truly impossible mission. How can he remain faithful to Jon's angelic one of a kind sound and not sound like a clone? Tonight, I don't know how, but I can tell you he accomplished this magical task with aplomb. Jon Anderson is one in million, but Benoit David hit it out of the park on every song without fail. His efflorescence seemed to infuse the band with sparkle they can sometimes seem to lack as they methodically work to reproduce incredibly complex musical passages on stage. I have read others say Benoit has had some difficulty with certain songs of the repertoire, so I was on alert. As a persnickety Yes fan, I can tell you I did not see one through 2 hours of some of the most challenging and complex music I believe has ever been recorded. They must have borrowed both David Copperfied and Lance Burton from down the block to produce this illusion. I thought the band may have had Geoffe Downes sit in for this leg of the tour as he was a former band member. Perhaps this may have been the more cost effective choice, but you know Yes with that damn musical integrity stuff again. The band stuck with Rick's recommended replacement and I am glad they did. Oliver Wakeman was also up to the task of filling impossibly large shoes on this night. He goes about his job with a bit less flair than Dad and his white beaded cape. One of my favorite memories was Rick in that cape in front of a phalanx of 12-15 keyboards of varying complexity, flanked by statues of Mozart with 6 or so long neck empty bottles of beer strewn on top by the end of the concert. Although Oliver's demeanor seemed composed, he played with fire and incredible precession like his old man. His chromatic nuance helped propel the band. As with Benoit, it must be hard for a great musician in his own right as Oliver is to maintain some sense of musical autonomy. I feel your pain. But I never liked the way Patrick Moraz added his own flourishes and arpeggios to classic Yes songs. Moraz also brought his own sound with a different arsenal of keyboards and software, or what passed for software in the 70's. This structurally changed the fiber of Yes music to my ears, and I have read Moraz say that this may have lead to some dissonance at that time. Oliver was faithful to the original music in both sound and execution. With new technology you may think it is a simple task to reproduce relatively primitive keyboard synth sounds from the 70's with musicians routinely carrying terabytes of libraries on tour to feed their modern instruments. Newer instruments may sound the same to the untrained ear, but there is a big market for early vintage synthesizers and I may have seen one or two on Oliver's stack. This attention to detail paid big dividends in making the Yes classics sound authentic and not like a tribute band. I could feel AND hear Rick's tutelage. Seeing Oliver move around and twirl his long blond hair like that other keyboard player was great fun. YES with special guest ASIA is certainly a show worth seeing this season. ASIA performed a strong mix of material consisting of 4 selections from their first album " Wildest Dreams, "Only Time Will Tell", "Sole Survivor" and the encore and crowd favorite "Heat Of The Moment", 2 acoustic pieces from their second album "The Smile Has Left Your Eyes" and "Don't Cry" with Carl Palmer, tambourine in hand, leading the crowd with hand claps, 1 from Phoenix, the extraordinarily moving " An Extraordinary Life" and three retrospective pieces. The retro selections were equally great with Geoff Downes' "Video Killed The Radio Star", the Aaron Copeland classical piece as performed by ELP "Fanfare For The Common Man" featuring Carl Palmer's traditional grip drum solo and King Crimson's "In The Court Of The Crimson King, though deeply involved fans I think would rather have John Wetton doing something he created that ultimately represented his time in Crimson such as "Starless" or "The Great Deceiver" rather than a song he merely performed in his Crimson days.I think this choice was merely to give cursory fans something they would recognize. YES's show was equally superb. A fanatastic mix of material, truly for the dedicated YES fan as well as showcasing their career for the novice. "Astral Traveler" from "Time In A Word" through to "90125". The hits were there with "Owner Of A Lonely Heart" and "Roundabout" but the ultimate treat was the performance of "Heart Of The Sunrise", the dry ice dream of "Machine Messiah" and my favorite of the show "Tempus Fugit". Some may think the choices were too obscure, but lengthy, technically intricate, powerful compositions are what YES has always been about. All 4 members of ASIA and 5 of YES were on top of their technique with all of the material played with energy and enthusiasm. Carl Palmer played as if he was still 22 years old, Steve Howe nailed guitar parts while dealing with technical difficulties that would have destroyed alot of players, Geoff Downes is the sound of ASIA and John Wetton's vocals are as soul stirring now as they ever were not to mention the colossal power of his bass playing renowned since his Crimson tenure. Chris Suire is a bass legend for a reason which was evident tonight. He prowled the stage like a great beast with his ever present Rickenbacker exhorting the crowd to frenzied response. Drumming statesman Alan White has always served the music he's played first and which he continues to do, serving up odd time song sections with a confidence and fluidity that the rest of us can only aspire to. The newest members are welcomed new blood. Their mere presence spurred the older members to much more youthful performances. Oliver Wakeman is the best fit on keyboards with YES since his father Rick held the position and Benoit David on vocals is more than capable of holding his own on that stage. He obviously loves the music and is clearly loving the position he is in creating that music. Sixty minutes for ASIA and 2 hours of YES was not nearly enough time for these phenomenally talented gentlemen. Do not short change yourself this concert season. You will not be disappointed in these two progressive rock monsters.